We went to Maine to visit Acadia National Park, but mainly, it was to eat lobster, lots of lobster. Boiled lobster. Lobster rolls. Lobster everything. Ellsworth, a sleepy town near the coast, was just a stopover--a cheaper place to stay than Bar Harbor, which is the more touristy city closest to Acadia. That first night, settling into our hotel room, tired from the long drive from Boston Logan, we decided to find something to eat not too far away. We still wanted our first meal in Maine to be lobster, but we weren't going to be picky on the place. If it was around the corner, even better. 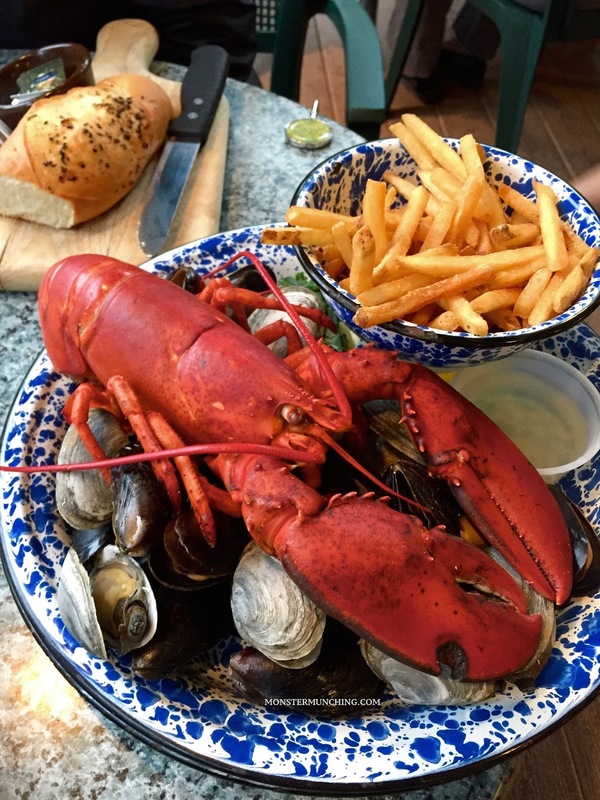 We saw Union River Lobster Pot on Yelp. The pictures looked good enough. Most important, it was just a few blocks away--a local place. But what it ended up being was one of the best restaurant experiences of our entire trip. First, that name isn't just a name. 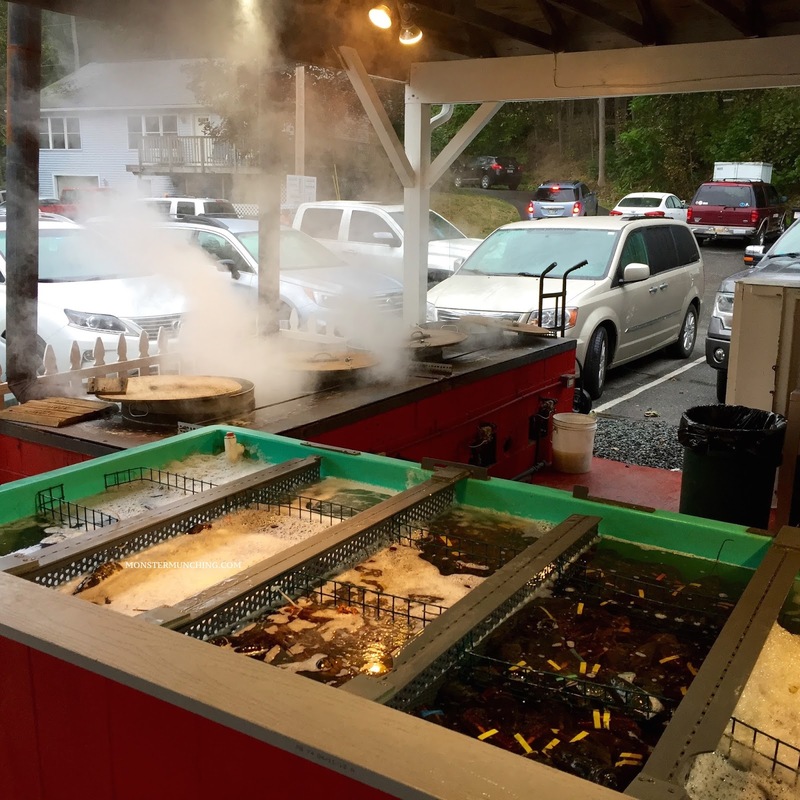 This seafood shack, with its outdoor cooking pots billowing steam, is located on the banks of the Union River. And the table we got, next to a window that's actually just a mesh screen, gave us a view of not just the garden but the river itself, a meandering creek shaded by trees--a scene idyllic enough for a Thomas Kinkade painting. And our meal, called "The Downeast Shore Dinner"--consisting of a 1 1/4 boiled lobster with clam chowder, steamers, mussels, hot drawn butter, clam jus, French fries, coleslaw, and a loaf of homemade bread--cost us a little less than $30. This was an incredible price for a lot of food that we wouldn't see repeated again in any of the more tourist-trappy seafood restaurants in Bar Harbor. 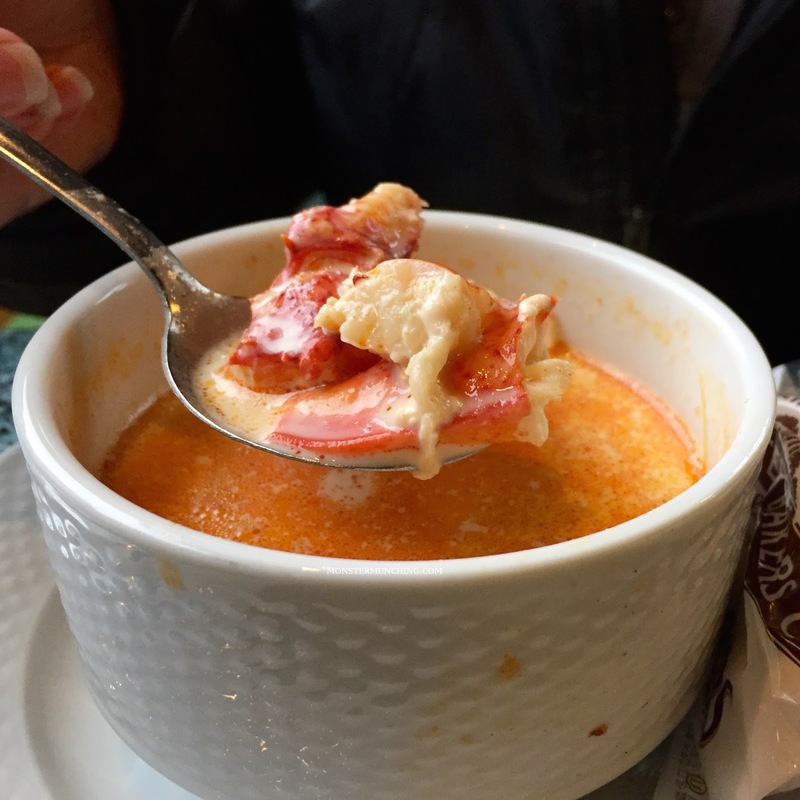 We also discovered that the Union River Lobster Pot featured a lobster stew that tasted like nothing we've eaten before. The soup was thin rather than thick. And because it was, we could appreciate the flavor of the lobster meat itself, of which the soup had in abundance. I still dream about that stew. Since returning home, I've been searching the Internet in vain for a recipe. If you know how to make this nectar of the shellfish gods, please drop me a comment. But if you are, yourself, considering a trip to Maine to see Acadia and eat lobster, you need to go to Union River Lobster Pot. Do it before the likes of Andrew Zimmern and Anthony Bourdain discovers it and tells the whole damn world. 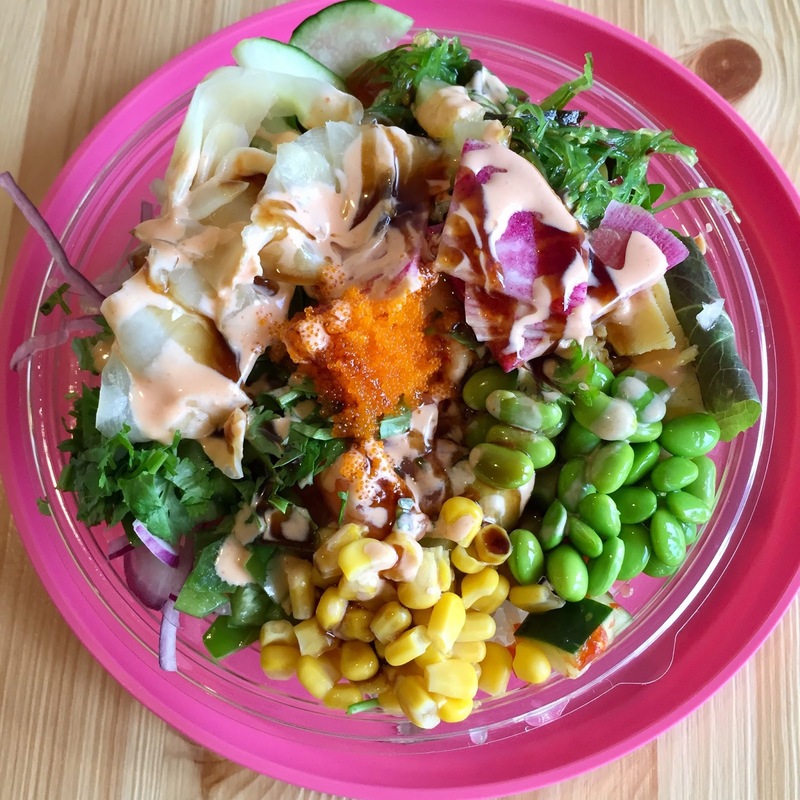 Nishi Poke & Ramen Bistro is not anywhere close to where I roam. It's in LA; and not just LA, but Rancho Park, a place that I can honestly say I've never heard of. But the place came highly recommended by a friend and mentor of mine, who I not only respect professionally but also on matters of food. He insisted I try it, even offering to pay for my lunch. I told him that wasn't necessary. I was already curious because while Southern California is crawling with build-your-own poke joints and ramen shops, this restaurant is the first I've seen that attempts to do both. 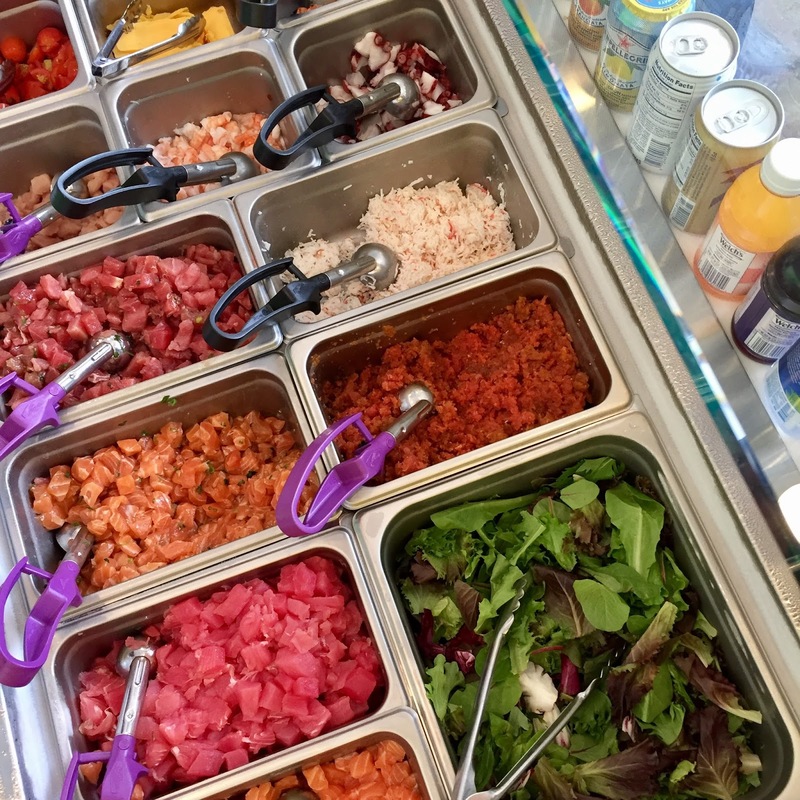 Ramen and DIY poke are two separate and vastly different operating models. So this was a completely new concept--a two-in-one. It was as though Chipotle started offering burgers. The restaurant was set-up exactly as I thought it would. The poke bar was on one side. The ramen counter with its own blackboard was on the other. But the dining room was a lot better-looking than the tiny strip mall plaza and its atrocious parking lot would have led me to believe. It is, in fact, a very charming bistro. Each table had compartments stocked with ornate chopsticks and designer ceramic soup spoons. Fanciful sketches of commissioned art decorate walls made of blackboard. I could tell that the owner invested a not insignificant amount money remodeling the place, making it sunny, chic, and fashionable for sunny, chic, and fashionable Westsiders. Even the poke assembly line got upgrades. It offered not only the usuals of ahi, salmon, and shrimp, but also crawfish, which, in my opinion, is as good as lobster. In addition, there were complimentary toppings I'd never seen before, such as tamagoyaki (Japanese omelette) and watermelon radish. While the poke is great, the reason to go is the ramen. The noodles hit the chewy sweet spot: not too firm, not too soft. And they're substantial too--thick, almost udon-like--with the consistency of Chinese hand-pulled. For now, there are only three broth options, with the spicy miso being the best. 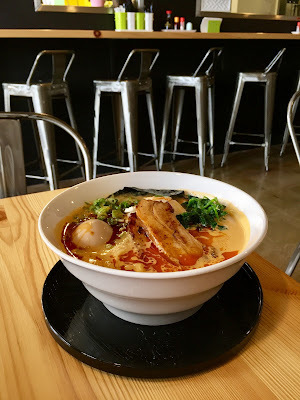 I knew I was in for a treat when I saw the shifting pools of red floating above the creamy 24-hour-simmered tonkotsu broth. And it's a good, steady heat, not overpowering but hot enough to keep me sipping to maintain the hurt. By the end of the bowl, I was sweating so much I'd depleted the table's napkin dispenser. But there were other things to love about it, including wads of freshly boiled spinach, cooked cabbage contributing an unexpected sweetness, and two pieces of generously thick pork belly that were broiled to gild the edges with char. A soft boiled egg was an extra add on, but essential--the yolk straddling the tenuous balance between liquid and solid. It's perfect and a fitting symbol of how this restaurant has managed to successfully straddle the tight rope of two genres.